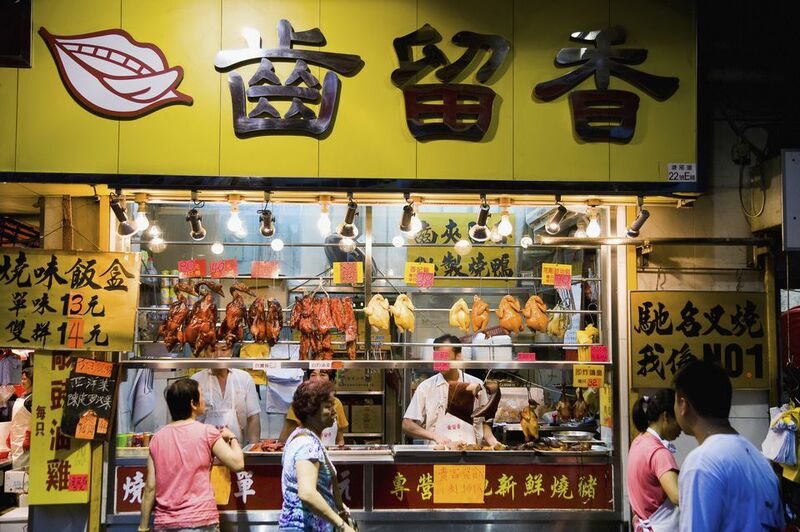 Hong Kong's street food is one of the city's unique experiences. Identifying individual Dai Pai Dongs is nigh on impossible, as they often have no name, move locations and many kitchens frequently meld into one. Instead, below you'll find a list of the best areas to find some good quality Dai Pai Dongs - from traditional shacks serving up lunch to the masses to the street side stalls hawking waffles. A collection of Dai Pai Dongs right in the heart of Central. The quality of food is decent if not renowned, however, you will find at least a couple of owners who have a smattering of English (although hand pointing will remain the lingua franca). Be warned: this place gets swamped by office workers during lunch hours 12:30 - 2:00 pm, and it's worth trying to avoid those times. Graham Street, Central. Daily 6:30 am - 8:00 pm. Brave this shady looking street to find some of Hong Kong’s most celebrated Dai Pai Dongs. The streets here are alive in the evening when the various Mongkok night markets swing into action. For something sweet try one of Hong Kong’s famous waffles. The chocolate chip stuffed versions at Modos are said to be some of the best in the city. For a truly local experience head to Sham Shui Po and join the market workers and fabric salesmen at the wooden tables set up each lunchtime. The stand-out option is Keung Kee. This traditional Dai Pai Dong is inside a metal shack, where you’ll find pots of steaming chicken claws and boiling vats of delicious chicken stew. It’s a friendly place where the chefs know their customers by name. Li Kung Street, Sham Shui Po. Daily 7:30 am - 9 pm. Attached to the Temple Street Markets, this collection of Dai Pai Dongs are some of the best in town. Just like the market, they are best seen at night when you'll find a glut of locals tucking into excellent seafood and Tsing Tao beers. The streets are wide and the outside seating is a great chance to see life going on nearby. You are unlikely to find any English spoken. Temple Street, Yau Ma Tei. Daily 7 - 11 pm. A fairly compact collection of Dai Pai Dongs selling a mixture of Cantonese and Seafood specialties. Near Kowloon Park. Again, it will be packed with office workers during the 12:30 - 2:00 pm rush. Haiphong Road, Kowloon Park, Tsim Sha Tsui. Open Daily 12:00 pm - 9:00 pm. A good selection of Dai Pai Dongs with a wider range of food than can be usually found elsewhere. Both Shanghainese and Beijingnese food ca be found here, as well as the usual Cantonese fare. English won't be spoken. Hau Fook Street, Tsim Sha Tsui. Daily 7 am - 7 pm. Although there is no dedicated area containing Dai Pai Dong's there are a fair few individual shacks and stalls scattered throughout the Causeway Bay shopping area. Due to the tight space seating is often limited, however, English is likely to be a little better understood. Causeway Bay. Various Opening Hours.